Suitable for all stubbies 345ml, 355ml and 375ml such as VB, Carlton Draught, James Squires, Corona, Pure Blonde and Coopers. 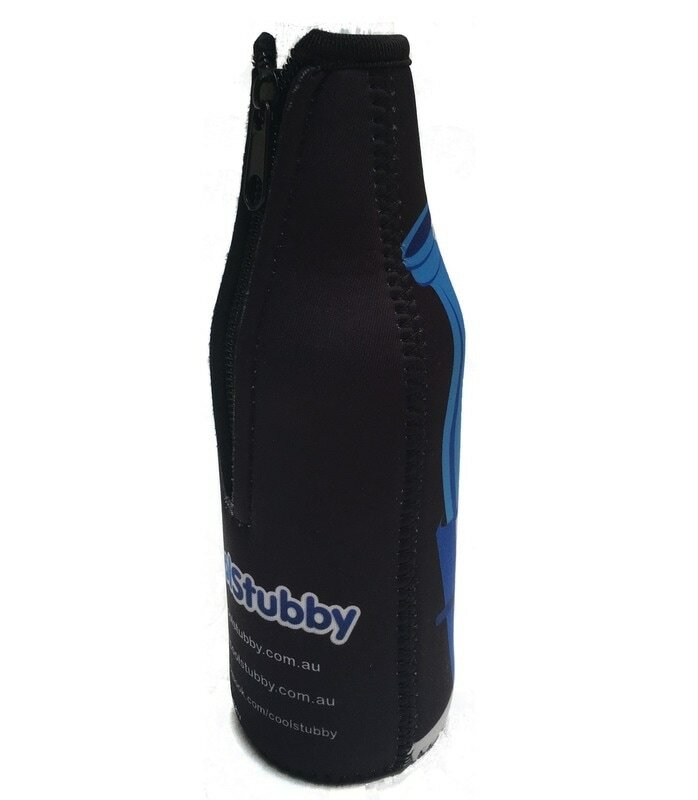 Zip-up Stubby holders are made with 3mm thick neoprene (wetsuit material) and fold down flat when not in use for easy storage. The Zip-up Stubby Holder seams are joined with a strong zig-zag sewn seam. Guaranteed to last the distance. These stubby holders zip right up to the neck of the stubby providing full insulation to keep your beverage colder for longer. We offer free artwork and design for all our orders and unlike many other companies there is no charge for print set-up and no add on fees. * Delivery times are approximate and may vary depending on the delivery location. Please contact us for an accurate estimate. Be sure to include the quantity that you require, any specific colours and text you would like to include and feel free to attach your own photo, logo or any other image and we will use it to personalise your stubby holder design. You can also view some of our templates and see if anything suits your event. We will come back to you within 24 hours with a quote and a design for you to review and confirm before proceeding with the order. Also feel free to ask any questions about the process that may not be covered in our FAQs page.